Nonfat dry milk has a myriad of uses. More affordable than liquid milk, it also has a much longer storage life. It adds bulk to breads and casseroles when added in powder form, and it can pinch-hit for milk as a beverage or cooking ingredient when reconstituted. But, depending on your needs, other products can step in and replace nonfat milk powder, especially in baked goods and health shakes. Many substitutes are dairy-free, which is useful for vegans and those with allergies. 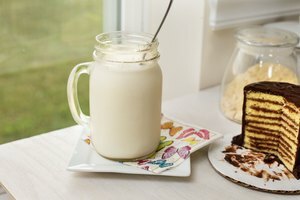 Some dairy powders are obvious alternatives to nonfat dry milk. Skimmed milk powder is the most readily interchangeable with nonfat dry milk. As the names suggest, the main difference lies in the fact that powdered skim milk has a small amount of fat remaining, while nonfat milk has none. Powdered skim milk also provides some protein, while nonfat does not. Dry whole milk, a good source of protein, can also work well in baking in either powdered or reconstituted form and lends a slightly creamier texture. Buttermilk powder provides an acidic base for tenderizing baked goods, and it's lower in fat than dry whole milk. You may need to go to a health food store or a mail-order source for plant-based milk powders, but they are good substitutes it you have dairy-related allergies or ethical issues. These products are best used for their culinary properties rather than as nutritional twins of dry milk, because each has its own unique nutritional profile. Powdered rice milk, powdered potato milk and powdered coconut milk substitute for dry milk on a 1-to-1 basis, and they are good choices if you have allergies. Some coconut milk powder manufacturers add milk protein, so check labels carefully. You may also find that the higher fat content and coconut taste do not suit your needs. If you're on a liquid diet, soy and whey protein powders are useful for adding nutrients and are often free of lactose. For weight gain or a muscle-building boost, add them to smoothies and shakes or incorporate them into cream soups, pancakes, oatmeal and scrambled eggs. Whey protein isolate and soy protein isolate or soy protein concentrate is useful for people with lactose intolerance. Whey protein isolate is less grainy and "beany" tasting in baked goods than soy powders. Whey protein concentrate is an affordable powdered protein product, but people with lactose intolerance should avoid it. Of all the readily available nuts, cashews most closely resemble milk powder once they are ground, and they are less apt to add graininess to baked goods and sauces. Use a clean coffee bean grinder or spice mill to get the finest texture, and push the powdered nuts through a fine-mesh sieve to remove the larger pieces. Cashew powder adds protein to meals, but it's higher in fat than nonfat milk powder and not a good choice if you have nut allergies. 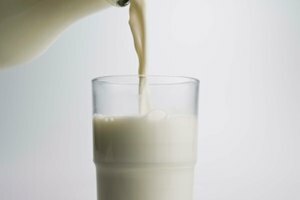 Whole milk and cream should be avoided when they would make a dish too wet, as in some casserole and bread recipes. But in soups, sauces and baked goods in which another liquid is used along with the powder, liquid milk products make useful -- if less affordable -- substitutes. For every 1/4 cup of nonfat dried milk specified in a recipe, use about a cup of cream, whole milk, skim milk or nonfat milk. 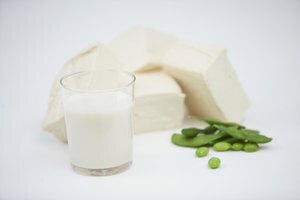 Dairy-free liquid milks, such as soy and rice milk, are also possible substitutes. Be sure to eliminate all or some of the other liquid called for in the recipe.